What Does Code P0112 Mean? We already know that an engine needs fuel, air, and spark to run, but to run efficiently and most effectively, the engine control unit powertrain control module (ECU or PCM) needs to control these elements precisely. Depending on engine speed, engine load, coolant temperature, and air temperature, the ECU fine tunes fuel volume, ignition timing, variable valve timing (if applicable), and some emissions controls. Intake air temperature (IAT) is a measurement of the ambient air coming into the engine at any given moment. This is important, since warmer air is less dense and vaporizes fuel faster, so less fuel needs to be injected. Conversely, colder air is denser and vaporizes fuel slower, so more fuel needs to be injected to get the same amount of power. 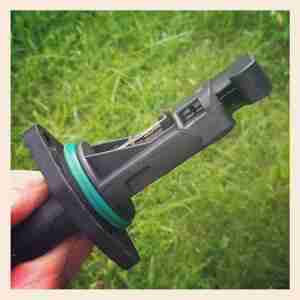 The IAT sensor is therefore located in the air stream, usually after the air filter. Sometimes, the IAT sensor is integrated in the MAF (mass air flow) meter, otherwise it will be a separate sensor. 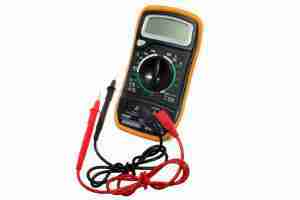 The IAT is a thermistor, which works by modifying a 5 V reference signal from the ECU. As temperature goes up, the IAT sensor’s resistance goes down, and vice versa. The voltage that the ECU reads on the other side is calculated as the temperature of the intake air. Different vehicles will have different values, but one typical Ford IAT sensor reads as in the table above. Many manufacturers use a similar scheme, resistance dropping as temperature rises, while some use the opposite scheme, resistance increasing as temperature rises. The ECU’s internal memory table will recognize the voltage, not only to measure intake air temperature, but also to identify any fault. If the IAT sensor sends back a voltage far outside the acceptable range, the ECU will set a diagnostic trouble code (DTC). In case the IAT sensor reading returns an unusually high temperature, typically over 300 °F (149 °C) or less than 0.1 V at the ECU, the ECU will ignore the reading, set DTC P0112 – Intake Air Temperature Low Input, and illuminate the MIL or CEL (malfunction indicator lamp or check engine light). DTC P0112 may be accompanied by other IAT- and MAF-related DTCs, such as P0110, P0101, or P0102. What are the common causes of code P0112? Depending on year, make, and model, DTC P0112 may have number of causes. Here are some of the most common. Contaminated Sensor – If the IAT sensor is especially dirty, such as due to a poorly-installed air filter or excessive positive crankcase ventilation (PCV) blow-by, the sensor may deteriorate or won’t react as fast to temperature changes. This type of failure would likely be accompanied by DTC P0110 or P0111. Diagnosing DTC P0112 is not a particularly difficult task. The sensor itself is simple in operation, which makes its analysis easy. On the other hand, if you have to trace an open or short circuit in the wiring harness, this will take time and patience. Depending on year, make, and model, the IAT may be reasonably priced, less than $100 in many cases, but if it is part of the MAF sensor, this will increase the price significantly. Have a professional double check your work before you condemn the MAF/IAT. Similarly, if you have done all your checks and suspect the ECU may be at fault, have your work double checked by a professional, before you condemn an expensive ECU. What are the symptoms of code P0112? Other than the MIL with just DTC P0112 in memory, you may not notice any drivability issues, though some engines may hesitate when cold, or ping when hot. Of course, with the MIL on, you’ll notice a drop in fuel economy, as well. How do you troubleshoot code P0112? This is a simple circuit, just two wires running from the ECU to the IAT sensor. If you have access to a scan tool, you can use it to read temperatures directly, otherwise you can use a DVOM (digital volt-ohm meter), thermometer, and a short pin, such as a thin wire or paper clip. A resistance table for your specific year, make, and model, will be especially helpful. 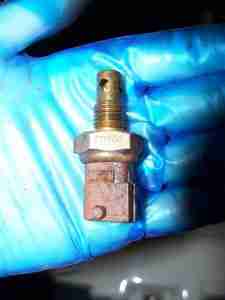 You can often find these online, or perhaps if you ask your local trusted automobile technician. Given that DTC P0112 refers to low voltage input to the ECU, we need to look at the voltage coming out of the IAT sensor and make sure that it’s getting to the ECU. We hope so, too. Check in if you have any questions. Don’t forget to mention your YMM so we can find information specific to your car.